Bowers & Wilkins has seriously been ramping up its consumer audio game in the past few years -- notably, with products like its Zeppelin speaker systems for iDevices and its MM-1 desktop speakers. While speakers seem like an obvious choice for a company famous for HiFi systems, you probably wouldn't have thought of B&W for your next set of iPhone-compatible headphones -- that is, until its $300 P5 mobile HiFi supra-aural 'phones released last year. 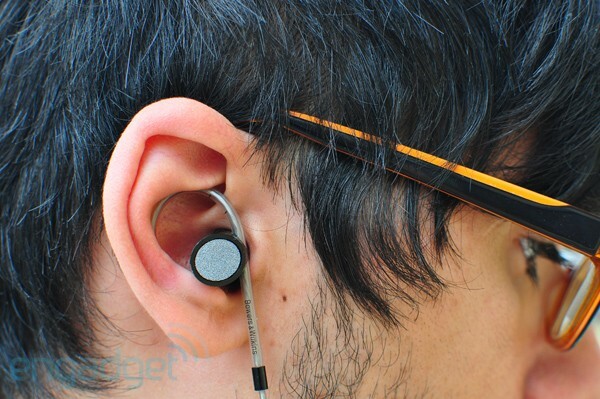 This year, the company has taken a second step into the game with its C5 in-ear headset. 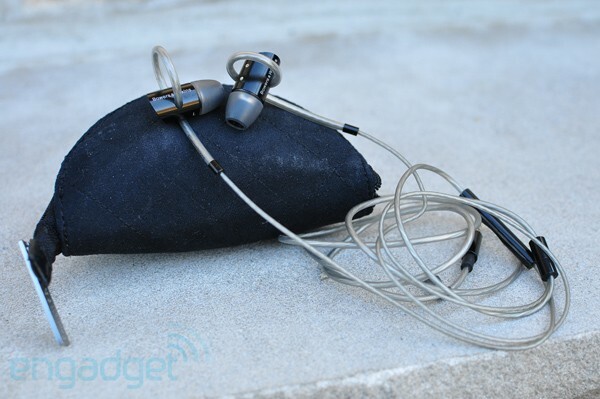 Priced at $180, they're a possible contender for those who'd prefer earbuds to on-ears, or maybe want some B&W headgear at a less expensive price point. We've grown fond of our leather-clad P5s for chit-chatting on the phone and rocking out during the commute, so we were curious to see, hear, and feel what the C5s could bring to the table. Luckily, B&W dropped off a pair of the in-ears on our doorstep, and we got to give them a healthy amount of use while commuting in and out of NYC to find out if they'd also win us over. It's all detailed just past the break. Those seeking iDevice-compatible in-ear headphones with a luxury finish and rich sound will find a lot to like in Bowers and Wilkins C5. How would you rate the C5? Getting the C5s out of the 12 fasteners in the box was a struggle, but after our mini-battle of human versus packaging we were greeted by two more boxes of goodies: paperwork with free HiFi downloads, a velour hard-shell case, airplane and right angle adapters, and three extra sizes of silicone ear tips. The bullet-shaped aluminum buds are finished in glossy black with a pavé core comprised of hundreds of super-tiny steel balls (more on this later), and the silicone cabling / ear tips are a smoky silver color. We love the Zeppelin Mini vibe going on here, but we do think the pave's gleam in sunlight will either serve as an added ear candy-factor or a complete detractor for some. After a day's use we noticed subtle paint chips on the earbuds' outer-most edges, but otherwise the build quality is fantastic -- in a sense, boding luxury. 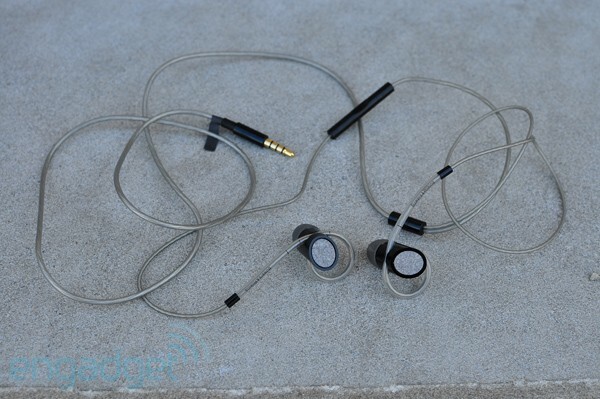 The C5s' IEM-style cable is thick, but still flexible down to its 3.5mm jack. While we admire the rigidness, there's definitely some moderate cable-noise while walking. For those unfamiliar, it's the annoying phenomenon of having buds in your ear and hearing your cables every movement or brush with what's around it. 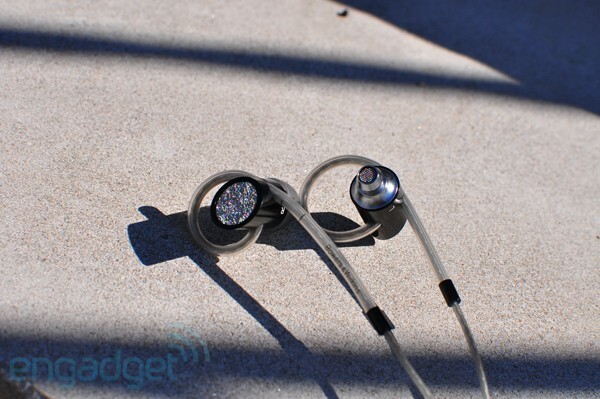 Our music never totally masked it on with the C5s, but that said, we've experienced worse. Moving up the cord, you'll find a B&W-style in-line controller / mic for iDevices; its buttons have a nice and clicky response with great tactile feel, despite the sometimes slippery glossy finish. After a few phone calls in the backseat of cab with the radio on, our friends' general consensus was that the C5s nearly canceled out the background noise, while still keeping our voice-quality clear. We know the fit of in-ears is a weird thing in general, and the C5s won't suddenly convert you to the dark side if you've never been privy to jamming silicon in your ear. For those who are, though, B&W's done two interesting things with these: first, there's some extra mass inside of the buds dubbed Tungsten Weighting, which aims to keep them sitting in the ear canal; secondly, an optional "Secure Loop" of extra-padded cable at the buds that contours along the ear's inner cartilage. The silicone tips themselves didn't sit too far into our ears and provided enough cushion for a good fit. Impressively, we were able to shake our head many times until we nearly gave ourselves headaches and the buds simply wouldn't budge. Tugging forcefully on the cable did reset the Loops, but it's a welcome buffer to save from painful pull-outs, or worse, frayed cabling. Putting it briefly, these are some of the most secure buds we've ever used, and we think those who like in-ears will find them fairly comfortable. By design, the C5s passively isolate noise. We found it admirable enough to dial down the whine of bus engines or subway cars during our treks, but make no mistake, it's not active noise-canceling. We didn't feel overly plugged up using them and moderate volume killed enough background noise to let us hear our jams just fine, while still letting a sliver of the world around us in (apparently, that's B&W's aim). How so? You ask. That silver core we mentioned isn't just for looks; it's actually a diffuser -- a feature dubbed the Micro Porous Filter. In theory, it should let the earbuds breath a little, and open up the perceived soundstage sort of of like an open-backed headphone, but without leaking very much. To test the sound quality, we mainly used our iPhone 3GS and iPad 2 -- these are made for iDevices, afterall -- with a variety of file formats and even CDs (you know, those silver discs you need an optical drive to use). 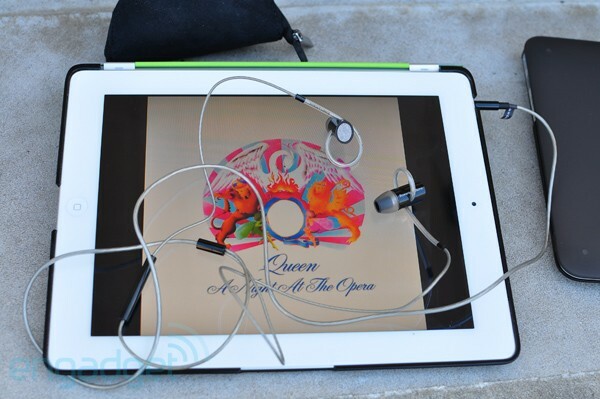 At first listen, the sound is a pleasantly open for an in-ear but still retains deep extension in the lows. More time with them showed that the C5s easily handled dubstep tracks like Bassnectar's "Basshead," providing thick and articulate bass down to the lowest of lows. With that said, they still had enough punch and crispness in the mids to let electric guitars comfortably roar in our ears with tracks like Blink-182's "The Rock Show." The highs, though respectable, tended to be fatiguing at louder volumes. Cymbal hits felt just a little too harsh and swishy, while higher-ranged vocal passes sounded a bit thin at times; most notably in Queen's "Bohemian Rhapsody," where Freddy's signature vocal belts became harsh and his "ts" inflections just a touch more sibilant that we would have liked. Our quips aside, we definitely think the C5s deliver when it comes to sound quality with great instrument separation and a roomy soundstage, even if the highs are a bit bright for our tastes. Were we impressed by Bowers & Wilkins second headphone offering? For $180 dollars, the C5s are no doubt a posh, well built, and comfortable set of iDevice-compatible intra-aurals with mostly great sound to boot. Aside from a bit of cable noise, mildly grating highs, and scuff-loving edging, these 'buds are definitely something to be had, noting we've used less fancy buds like Klipsch's $100 S4i that also do an admirable job. Overall, the C5s are a solid option if your heart's set on a micro-sized Bowers & Wilkins kit for listening on the go and making calls. Opulence has its price, you know?